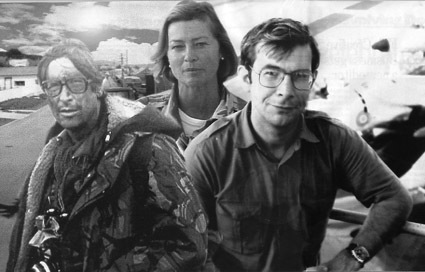 BEING TRUE TO "OUR BOYS"
There was a time - indeed, it could be argued that it is still with us on US television networks - when war correspondents understood what was expected of them. They were not there as entirely detached observers, though some did their best to be. No, the essence of their existence was to report tales of heroism by "our boys" and to help keep morale high on the home front. And if things weren't going entirely to plan, then the reporters would gently prepare the public for an acceptance of failure or heavy casualties. My first experience of this was as a wet-behind-the-ears sub-editor working in radio in Australia during the Vietnam War. Media policy was to report Allied military statements as fact while reports from the Viet Cong/North Vietnam were sneeringly dismissed as "claims". The Australian population hungered for reports of ANZAC victories and we did our best to bring it to them. Eventually, though, the game was up for the Allies and afterwards we all felt guilty that we had been swept along by the prevailing wind of misinformation, misplaced patriotism and outright lies. But journalists can be slow to learn and other conflicts followed - some big and some small - in which journalists failed in their duty to scrutinise those who would wage war in our name. The BBC gained its respected reputation as an honest broadcaster during the Second World War because it reported Allied losses - some of them at least - as well as its victories. But much of that reputation was earned simply because the only comparisons were with broadcasters who saw no benefit in giving both sides of the story. One of the defence correspondents, Chris Wain, was a major in the TA, while another, Chris Lee, was a commander in the Naval Reserve. The higher-management view was that this was perfectly OK because it provided contemporary first-hand experience of the way the military worked. When I raised the issue with a senior BBC manager, himself a former military officer, he could not see that there was an issue. "But what," I asked, "if they needed to expose some military wrong-doing?" His reply was uncomprehending: "Well, they wouldn't want to, would they!" Arguably the low point in modern war coverage was the Falklands conflict. Because of the remoteness of the island, the Ministry of Defence had almost total control over every picture and every word transmitted back to London. And the grudging, sleep-inducing MoD briefings in London by the spokesman, Ian "Speak Your Weight" McDonald, were almost beyond parody. Andrew Walker, the BBC World Service defence correspondent at the time, recalls that there was no independent way of discovering the facts. "It was a unique situation, unlikely to be repeated," he says. But some of the blame for the lack of information could also be laid at the feet of the journalists on the battlefield. While the admirable Brian Hanrahan battled the censors and immortalised the observation "I counted them all out and counted them all back again", there were others who regarded themselves as de facto extensions of the British military. Max Hastings recently admitted that he got too involved when he was reporting the war against Argentina. But he wasn't the only person to "go native" on donning military fatigues. I remember having furious rows with one BBC correspondent, now happily working elsewhere, over his attempts to stop the World Service broadcasting material released by the MoD, but which he regarded as endangering the British forces. Coverage of the 1991 Gulf War was better, though still marred by displays of ignorance and gung-ho jingoism. For much of the time, television viewers everywhere were reliant on CNN for live television pictures and what I called "Holy Cow!" reporting. There were ceaseless images and exclamatory commentaries from Baghdad, but no context. If journalism provides the first draft of history, television coverage of this kind gave us no more than a series of unconnected scribblings in a reporter's notebook. CNN was not the only guilty party. Some BBC people who should have known better were sucked into the trap. At the time I was in charge of World Service newsgathering, and I clearly recall wincing as I watched pictures of Martin Bell and Kate Adie, among others, being paraded for the cameras in tanks. Another correspondent, since moved on, was banned for a time from doing live broadcasts on the World Service because of his affection for military hardware and the coalition war effort. Such behaviour undermined the more sober, thoughtful reporting of other BBC reporters in the war zone. Then there were the notorious briefings by General "Stormin' Norman" Schwarzkopf at what became known as the "Riyadh Follies". Many reporters were enraptured by his larger-than-life presence and the novelty of satellite photos and grainy videos of targets being destroyed with pinpoint accuracy. Only later did it become clear as the civilian casualties were brought in that some of the coalition bombs were far from precise and really not very smart at all. How different things are this time around for the BBC. Now the corporation is displaying a maturity, thoughtfulness and confidence not seen with previous war coverage. Much of this is down to the integration of the World Service and domestic newsgathering operations since the previous Gulf War. No longer do we see clear divisions between the way the conflict is depicted by the domestic and World Service reporters. Credit, too, must go to Richard Sambrook, the director of BBC News, who has made it clear in memos and public statements that he wants a different, more grown-up sort of war reporting. In the past, the World Service and domestic reporters regarded each other as rivals from different planets, rather than colleagues embracing a common ethos. Gone now, for the most part, are the reports that spoke of "our boys", "the enemy" and made cultural judgements that could not be broadcast to an international audience because of their insensitivity and downright ignorance. "What is undoubtedly true now is that BBC reporters are aware that when filing a story it is not only to a British audience but also to the world - in a matter of moments," says Phil Harding, the director of news for World Service. Harding says there is also a greater awareness by the BBC of the great diversity of cultures among the British population, a point picked up by Rachel Attwell, deputy head of TV News with responsibility for BBC News 24 and BBC World, who says the BBC has learnt from past mistakes. "The war in Afghanistan made us all extremely conscious of the need to avoid our attitude to Muslims being misconstrued," she says, "and we are also aware that this is not a 'popular war' and that this must be reflected in our coverage." The large number of "embedded" journalists travelling under the wing of the military has raised questions about their independence and the danger in the age of rolling news that small incidents can easily be given coverage disproportionate to their importance. Though we won't know until after the war how much censorship existed for "embedded" reporters, what we have witnessed so far has been some astonishingly well-balanced and sensible reporting. Sambrook admits that "embedded" reporters offer no more than "snapshots", but adds: "The more snapshots we have the more we can put together an overview of what is happening." Tim Llewellyn, a former BBC Middle East correspondent and a frequent critic of some of the BBC's reporting of Middle Eastern affairs, is, on this occasion, impressed by the current Gulf War reporting. "It's been much better than in the past with good delivery of material from on the ground and the questioning of the 'spinners' back at base has been good," he says. But Llewellyn also poses the question: "Why so much military jargon?" and I agree. It's true that such abominations as "collateral damage" seem to have disappeared from the BBC reporter's language, but "neutralise" and "take out" are still there and raise questions about a reporter's professional detachment. And why is it necessary to always name the type of tank or rifle? Does the public know the difference? Or care? I doubt it. But to retain a sense of perspective, let me take you back to July 1916 and the opening day of the Battle of the Somme. The Daily Chronicle devoted a full front-page to the events of that day, presented a tale of military triumph and great heroism - topped by the multi-layered headlines that were the vogue in that age: How the British Charged into Villages Beyond the German Front, Stories of the Great Advance, Villages Stormed Through Tempest of Bullets, Heavy Fighting and A Bitter Struggle, One of Our Best Successes Ever. Only well down in the body of the report did the Daily Chronicle get to the delicate subject of casualties: "Some ground was gained at great loss of life to the enemy," reported its correspondent Philip Gibbs, "though not without many casualties to ourselves." Then, lest his readers be unduly alarmed, he added these emolliating words: "Fortunately the proportion of [our] lightly wounded men was wonderfully high." It was only later - much later - that it was revealed that the British advance of one mile over a 3-1/2-mile-wide front had cost the lives of 19,240 British soldiers, with a further 35,493 wounded. War reporting has certainly moved on since then. Ian Richardson, a former senior editor with BBC World Service and BBC World Television, is now a screenwriter and book author.